For all you lovers of Japanese cuisine, this is the ultimate selection for you! 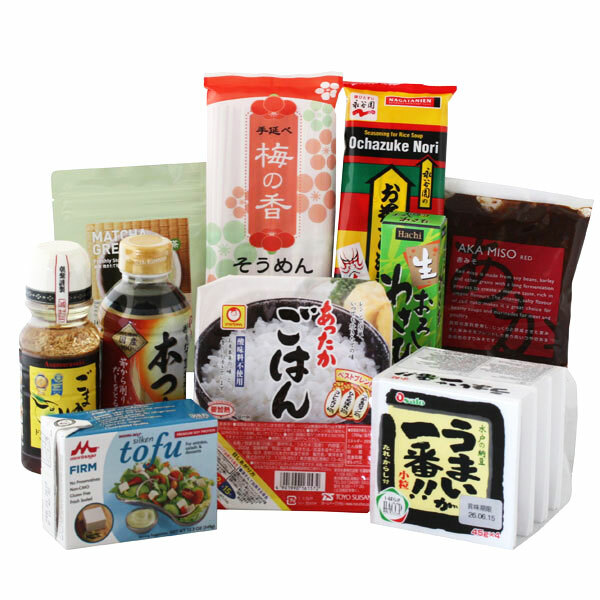 This range of quintessential Japanese ingredients includes tofu, miso, nori seaweed, matcha powder and much more. A unique selection indeed! This competition is open to UK mainland citizens only*. Entry couldn’t be easier. What do you need to do? Tell us your Japanese New Year’s Eve party cocktail! We will choose 1 winner at random on Thursday 18th of December. 1) *Week 3 – Christmas Party hamper winners may have UK mainland delivery addresses only. For me it has to be non-alcoholic and hot. Ever heard of “Pink Tea”. It is a traditional drink from Kashmir/Pakistan and is made in a similar way to chai, but instead of using black tea one uses green tea. I love it with a bit of crushed pistachios and almonds. An ice ball in 1 part of blue curacao (for the colour, to represent water), 2 parts Shochu, with a couple of dashes of Tamaryoku-cha & a couple of dashes of Umeshu, topped with Kabuse-cha leaves for decoration (to represent a flowering tree) and sugar frosting on the ice ball to represent snow. Japanese sake shaken with ice cubes made with yuzu juice and poured onto a crushed plum pickle! Japanese Premium and Craft Beer at Japan Centre- Taste Test!